Sports Center Saturday – Basketball on a Stage! My mom, Mary H (nee) Johnson, attended Bath Consolidated School in Bath Twp, a part of Greene County, Ohio, in what had been at one time two cities – Fairfield and Osborn. Those two cities merged to form Fairborn, Ohio. 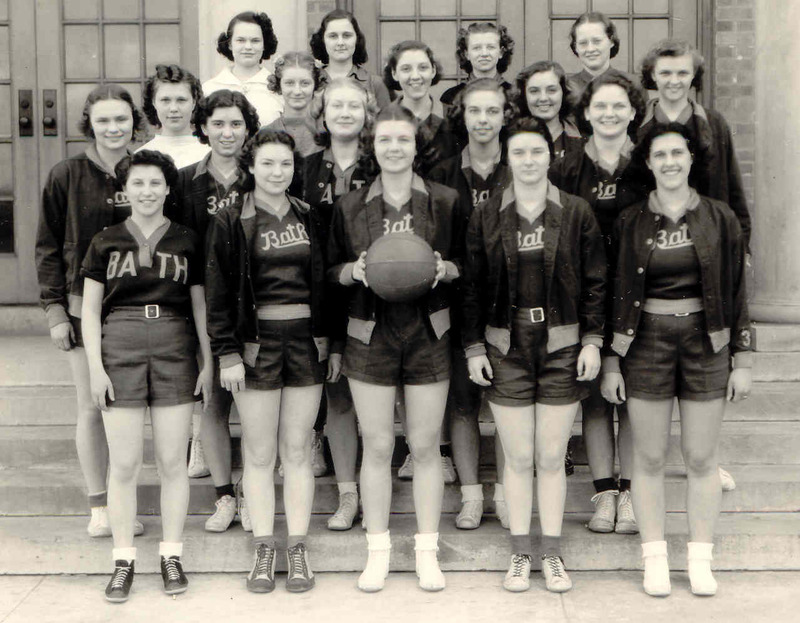 She graduated in 1939, and during her high school years, Mom was active in sports. Her game of choice was basketball. She was part of the high school girls’ team. Mom is at the lower right. My aunt (Mom’s older sister), Genevieve, is in the 2nd row from the bottom, 2nd from the right. Their future sister-in-law, Mary Van Tuyl (who would marry their older brother, Glen Johnson) is at the top row 2nd from left. Mom told me that when her school played in Beavercreek (the town where I graduated from), they would play at the high school – which today is Main Elementary. It didn’t have a gym so the game would be played on the stage in the auditorium. Every time I was in a theater production in high school, we would use that stage to perform, and I used to imagine my mom as a young high school girl running to and fro shooting hoops several feet above the floor. Someone could have fallen off the stage and been injured. While Mom was on the basketball team, she fell one day (not while they were playing on the stage) and another player stepped on her foot which crushed several bones in her toes. She ended up having three toes fused together to the foot bone. That was a reminder throughout her life of her time in sports. 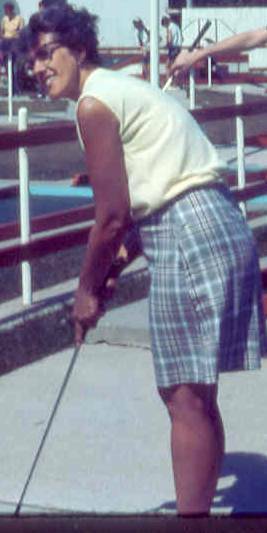 Mom also loved to play golf – even if that meant playing Putt-Putt with me when I was young. She followed college football all of her life (especially Ohio State), college basketball, all the Golf tournaments, and the Cincinnati Reds. She knew stats better than a lot of people. I think if she hadn’t married young, she might have gone on to golf professionally – or at least given it a good try. When I was young, she bowled weekly. She and Dad would always take their bowling balls wherever we went – just in case they found a bowling alley. And Mom was a left-handed bowler (even though she did most things right-handed)! Mom was proud of her letter that she earned playing basketball in high school. We displayed it on the table at her memorial service. But one thing I will never forget – every time I pass Main Elementary in Beavercreek, I think about Mom dribbling a ball on the same stage that I performed on.